Yay for TGIF! I'm thinking I want to treat myself to a spa day, and maybe this weekend will be the perfect opportunity. I'd love to get a nice massage and body scrub. When you want to pamper yourself, what do you do as a treat? 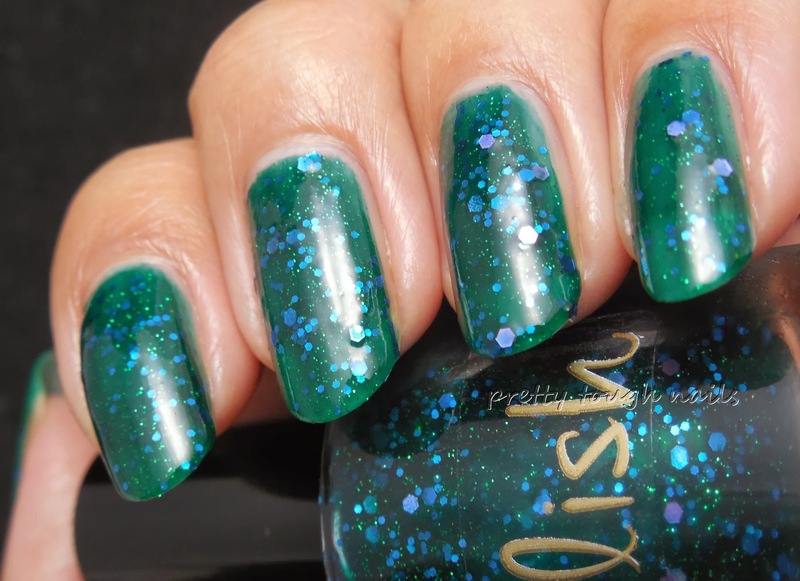 I've been craving a deep saturated jelly loaded with glitter, and what better polish to satisfy me but Pahlish Moats And Boats And Waterfalls. With a name like that, I expect something with aqua undertones and this definitely delivers. 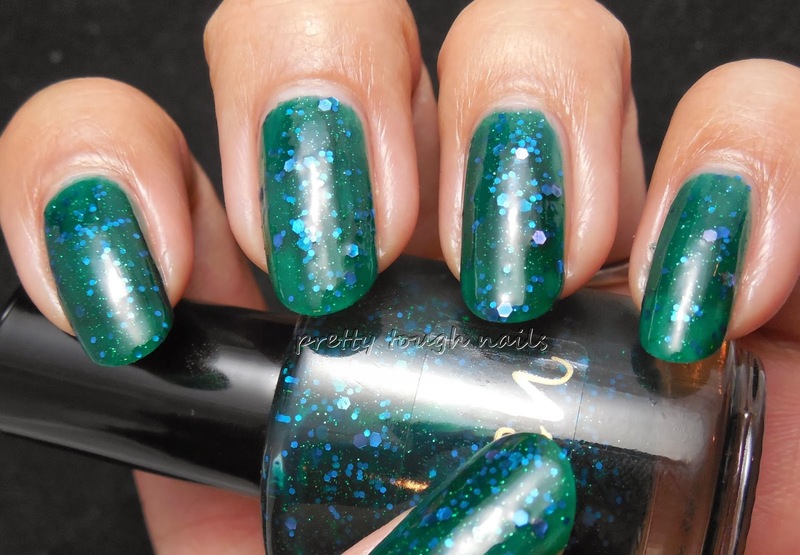 The base is a dark sea green with a wonderful squishy jelly quality that envelopes a beautiful medley of blue, green, and holographic purple hex glitters. The formula consistency was typical of a jelly polish, slightly thick but manageable, and applied with no streaking or stacking. I did have some trouble getting the brush to maneuver the polish accurately toward the cuticle area, but a little cleanup goes a long way. It was pigmented enough to provide enough coverage after two coats, but with my longer nails I do an extra coat for good measure. It dries to a matte finish so topcoat is needed for extra shine. I think the purple holographic glitters add a touch of magic to an already delightfully beautiful polish. The ratio of glitter is perfect and three coats allows for plenty of depth. This polish gives off tons of sparkle while not looking like a glitter bomb from afar, which is perfect for me when it comes to the work environment. Pahlish never fails to disappoint, my only regret is that I can't keep up with all the new releases. I saw some new ones get released recently that have me positively drooling. A girl could weep when it comes to breathtaking new releases - how can anyone keep up with it all? Ooh, this is a beauty! I'm loving everything about it. I know, it's so hard to keep up with everything when all of my indie brands are constantly releasing polishes I want. A spa day sounds fun! I've never done that before. I'm actually a huge sucker for bath products, especially body scrubs. I have a few of them which I got from two different shops on Etsy and wow, they are amazing. I hope you enjoy your weekend! Thank you lady! If only I had a money tree reserved only for nail polish. I'd be a lucky duck! 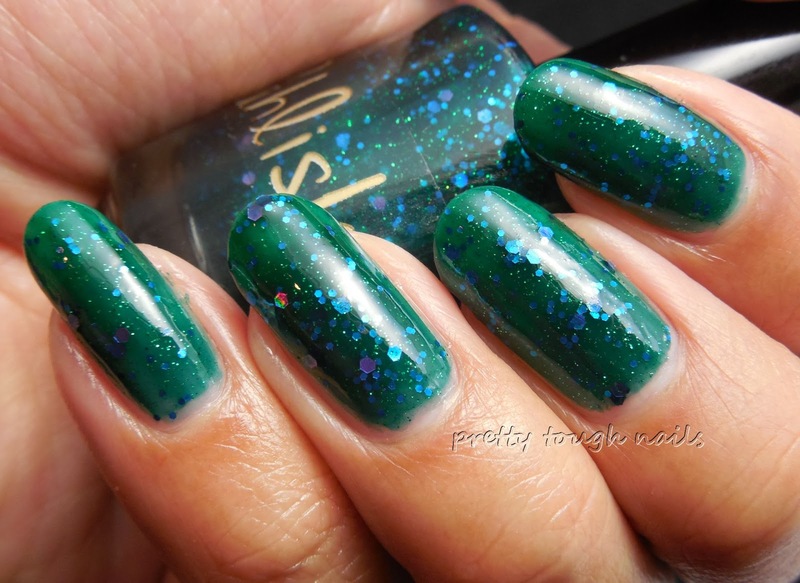 Beautiful swatches and photos, Thithi. Your nails are getting so long! They are indeed! This particular nail shape is resistant to breakage and my nails seem to grow super fast when I have them like this. What nice swatches! I know what you mean by not being able to keep up with new releases! Thank you! The new releases are endless, and always make my wallet cry!